Pumpkin and Gourd Still Life Watercolor Painting. Objectives: Students will learn what a still life is and how artists use overlapping to create the illusion of depth (3D space) in a flat 2D piece of art. Learn about the artist Paul Cezanne and how he used overlapping in his paintings to create a feeling of depth. How to draw pumpkins & corn with the FREE PDF below! Draw composition in pencil first. Use a yellow oil pastel to outline all the lines. Only do the outside lines on the corn. Use black to draw the table line. Use yellow, orange, black & white oil pastels to fill in some of the kernels on the corn (about 6-0 of each color). Paint with watercolors. I showed them how to paint 3D looking pumpkins with yellow first then orange around the lines & let the colors bleed together. If you choose to re-blog or use this lesson in any way (written or photos), then please make sure to link/credit Create Art with ME. Hi. I tried to get the pumpkin and gourd watercolor pdf and it kept giving me and error message. If you could check on that and find out if it’s me or the site, I’d appreciate it! 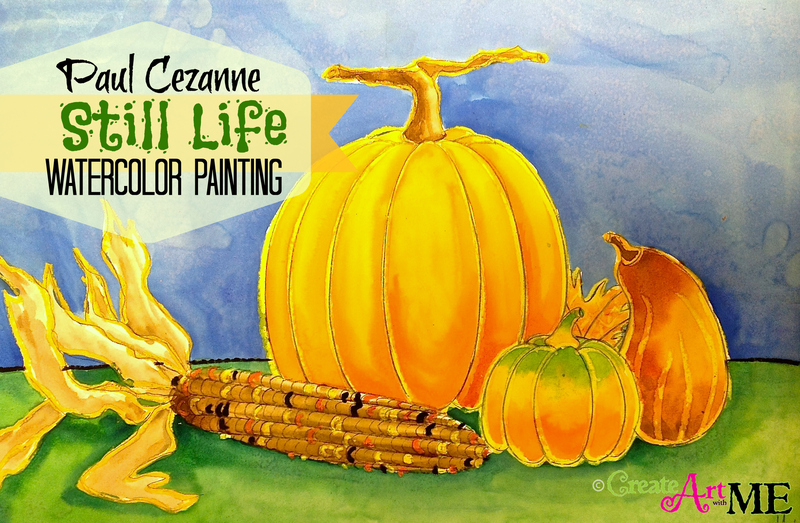 Hi Angie, I have fixed the link issue on the pumpkin and gourd watercolor pdf and it is working now! Thank you letting me know!